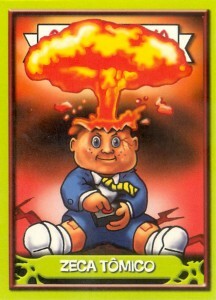 Adam Bomb is the most iconic Garbage Pail Kid of all time. He graces the front of countless U.S. and Foreign packs/wrappers, boxes, posters, advertisement literature, etc. 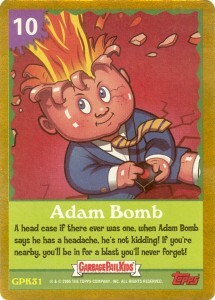 Here I will post all of the U.S. and Foreign Adam Bomb cards that I can think of. 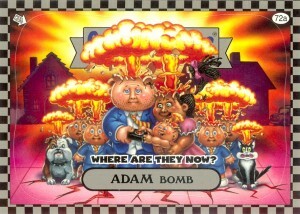 I am sure I am missing some so please let me know if you know of any other Adam Bomb cards. 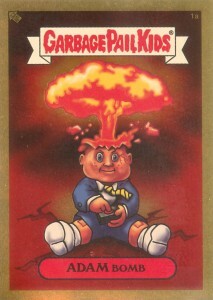 The U.S. first series Garbage Pail Kids are 3.5″ x 2.5″ and have a die cuts. 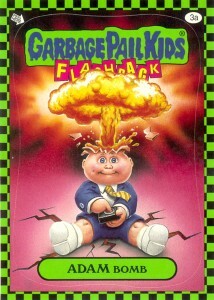 The U.S. version of the cards came with two back variations; matte and glossy. 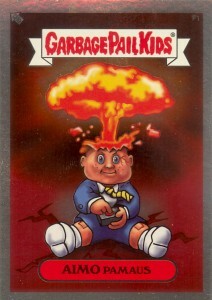 The UK 1st Series Garbage Pail Kids are smaller than the U.S. version (3.0″ x 2.1″) and are not die cut. In 1986 44 card test sets were released in Europe. These sets consisted of only ‘a’ cards. The test sets were found in Germany, Denmark, Holland, France, Jordan and Belgium. The cards were smaller than U.S. 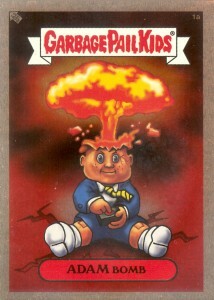 Garbage Pail Kids and measured approximately 2.125″ x 3″. 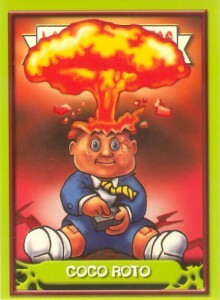 Below you will see the Australian and New Zealand versions of Adam Bomb. Both cards are found in the 1st Series releases for the respective countries. You will notice the main diference between the cards are the banners. The Australian Adam Bomb uses a straight banner while the New Zealand version has a curved banner. Both cards are smaller than U.S. versions and the same size as the UK version. 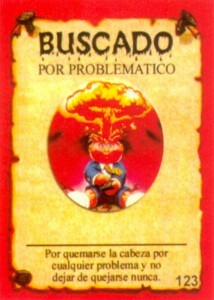 Below is the French and Spanish versions of Adam Bomb. Both cards are from the 1st Series releases. 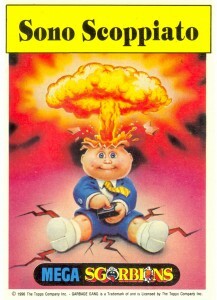 Both versions of the card are 2.5″ x 3.5″ which is the same size as the U.S. version. 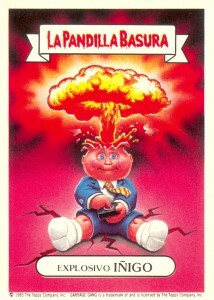 Next we have a couple offerings from South America; Argentina’s Alex Plosivo and Brazil’s Rambo Bomba. 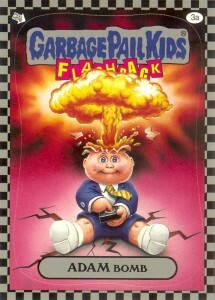 Both versions of the card are 2.5″ x 3.5″ which is the same size as the U.S. version. 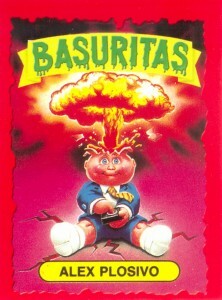 Notice that the Basuritas card has a die cut while the Gang Do Lixo card does not. Up Next we have two of the coolest and rarest Adam Bombs; the Japanese Bukimi Kun and the Israeli Havurat Ha’zevel. Both of these cards are the same size as the U.S. cards. 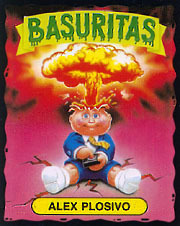 Very few Bukimi Kun cards are known to exist and the Israeli version of Adam Bomb also seems to be quite rare. Here are a couple of Argentine Adam Bombs from the Basuritas and Monsters release and an Adam Bomb from the Chile Solo Adam Bomb release. 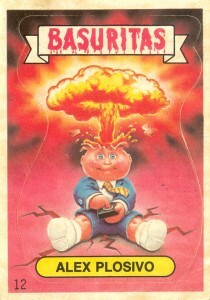 All of these South American Garbage Pail Kids cards are quite small and printed on very thin paper. Italy had quite a few releases. 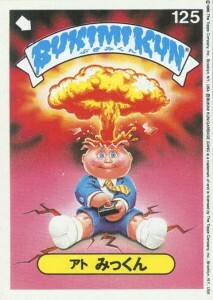 The card on the left is from the 1st series GPK release. 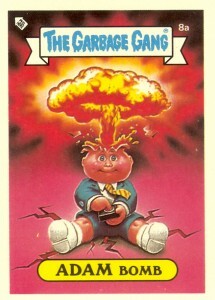 This card is 2.5″ x 3.5″. 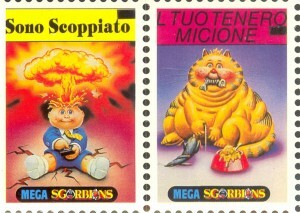 The card on the right is from the Italy Mega Sgorbions release and measures 3.4″ x 4.8″. 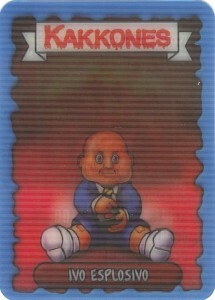 Please note that there was a second series Mega Sgorbions released with an Adam Bomb having the identical front as the one seen below. 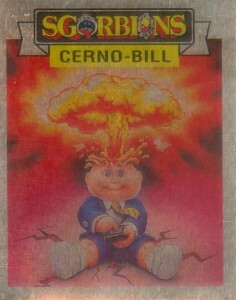 A series called Holiday Sgorbions was also released in Italy. This set contained two Adam Bombs. 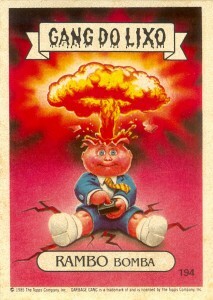 The one on the left is the Metallic Adam Bomb and measures 2.1″ x 2.7″ The card on the right is the Adam Bomb Tattoo and measures 1.7″ x 2.4″. The I Mitici stamp set was also released in Italy. 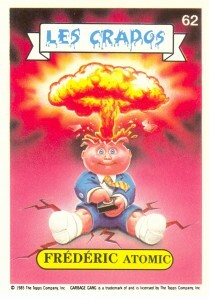 The card on the left is from this set. The card on the right is a lenticular Adam Bomb card that goes with the Italy Kakkones 1st series. 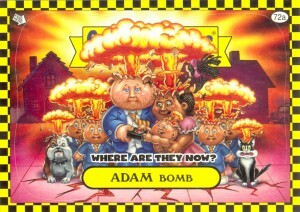 The next two cards we have are the ANS Adam Bomb Releases from Argentina and Brazil. 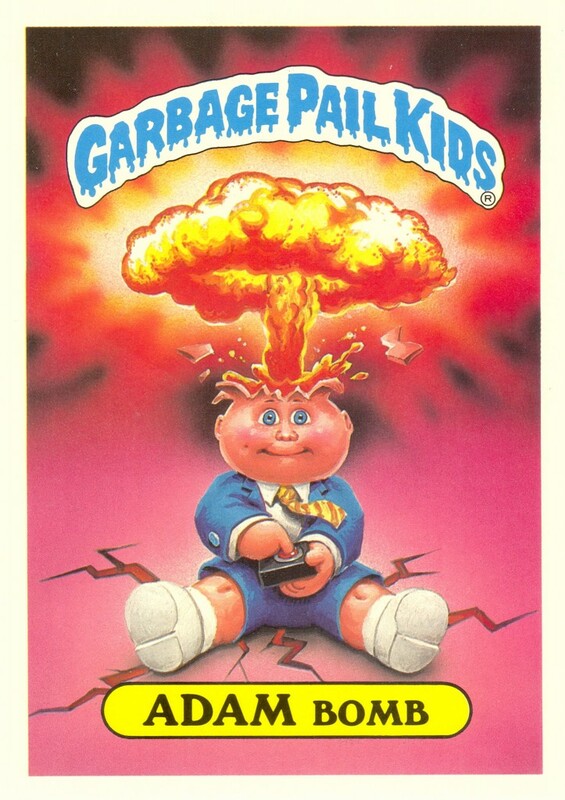 At some point the Adam Bomb on a lot of the newer cards started looking more cartoonish than previous older versions. 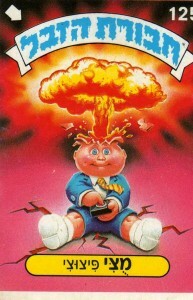 Here are a couple of lesser known versions of Adam Bomb from Europe. Both Sweden and Finland released ANS1 sets which included silver foil sub-sets. The first card in each sub-set was an Adam Bomb. Next we have two Adam Bombs from the U.S. ANS1 release; one gold and one silver. 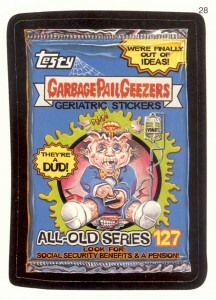 These were part of foil chase card sets for the U.S. ANS1 release. On the left we have the gold foil Adam Bomb game card from ANS4. On the right we have the gum wrap-around Adam Bomb which was found in ANS1. 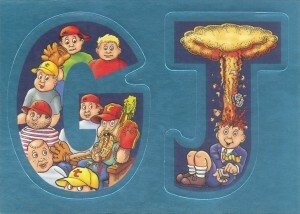 Up next on the left is the Adam Bomb Alphabet card that was found in ANS5. Back to ANS4 we also have an Adam Bomb Tattoo as seen on the right. 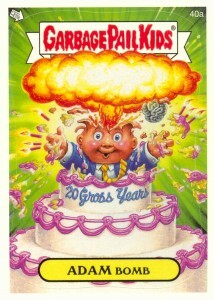 In the U.S. ANS4 release Topps did this card to commemorate the 20th Anniversary of the original Adam Bomb card printed in 1985. 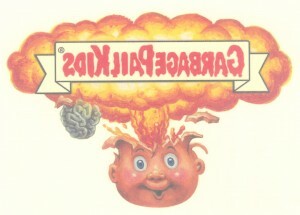 On the right you see a Wacky Packages parody of Adam Bomb. In 2010 Topps released the Garbage Pail Kids Flashbacks. 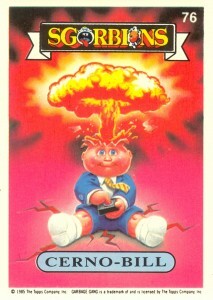 Card 3a was Adam Bomb. There were multiple levels of parallel colored borders (yellow, green, pink, silver and gold). 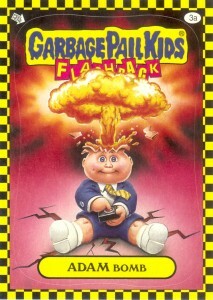 There was also a Garbage Pail Kids Where Are They Now (WATN) sub-set included in the 2010 Flashback release. 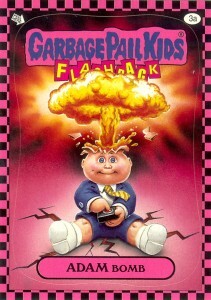 Of course Adam Bomb was featured in this sub-set. Love it…AW!!! Like the clean look and content of this page. Nice post, on a nice site. 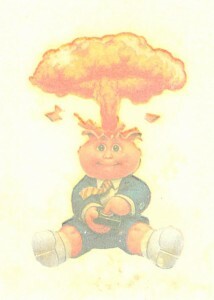 The only missing Adam Bomb i can think of, off the top of my head, is the F1 silver foil card the UK 2004 Gross card binder set.